The choir flexes its impressive vocal muscles with a host of talented musical friends joining them on Divine Decade. The album showcases their ability to move between musical genres with an almost superhuman effortlessness. With tracks that showcase a bit of everything, this is one album music-lovers will definitely identify with. The choir’s rendition of ‘Mighty God’ touches on the gospel element that they have come to be known for, while their rendition of Sarah McLachlan’s soul-wrenching ‘Angel’ is powerful and poignant. This kind of leap is commonplace on the album, with the choir tackling genres ranging from gospel and traditional to rock and more. To celebrate their 10 year-anniversary, Soweto Gospel Choir decided to record an album with fellow artists they’ve collaborated with in the past, as well as artists they’ve newly collaborated with in the studio last year. The result is a multi-faceted recording which shows the wonderful diversity of the group’s style as a gospel choir that sings all genres of music. Songs include Soweto Gospel Choir/U2’s Emmy Award winning “Put On Your Boots” and a New Orleans recording with Robert Plant, as a tribute to Fats Domino. The choir has previously sung with Kenya’s Eric Wainaina for the UN’s MDG campaign, and with Nigeria’s Joepraize for his own gospel album. After performing as Zahara’s special guest on her latest DVD, they asked her to join them on their own album for a male-voice, acapella version of her phenomenal hit “Loliwe”. Other friends include New Zealander Paul Ruske and local icons Solly Mahlangu, The Soil, Corlea Botha, HHP, Elvis Blue, Yvonne Chaka Chaka & Ladysmith Black Mamabazo, and Johnny Clegg, all of whom the choir felt honoured to have on the album as part of this unique experience. This group of 50 singers has achieved global critical acclaim as well as a throng of fans both at home and abroad. With YouTube hits of over 4 million on their track, “Amazing Grace” and with over 500 000 hits on several of the choir’s other videos, they truly do have a global audience. The choir has been nominated for four Grammy Awards over their illustrious career, and have won two. The first for their second CD “Blessed”, in the category “Best Traditional World Music” and the second for their third album “African Spirit”, in the “Best Traditional World Music” category. They have also won three ‘associated’ Grammys where the song and album they’ve featured on with another artist has received a Grammy – “Down to Earth” (Peter Gabriel), “Baba Yetu” and “Calling All Dawns” (Christopher Tin). To add to their international Awards, Soweto Gospel Choir received an Emmy in May 2011 for their collaboration with U2 on three songs featured in ESPN’s promotion of the 2010 FIFA World Cup. Peter Gabriel’s “Down to Earth” from the film “Wall-E” was nominated for an Oscar in 2010 and the choir performed the song with John Legend at the 2010 Academy Awards ceremony, being the first South African artist to perform at this prestigious event. In South Africa, the choir has been honoured with a Metro FM Award and three SAMA-awards. 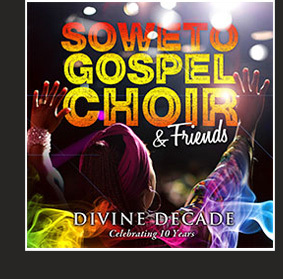 Continuing on their impeccable ability to deliver critically acclaimed and commercially viable work, Soweto Gospel Choir brings their most exciting offering yet with Divine Decade. Over the past decade, the choir has pushed the boundaries and delved into many genres of music, as is evident on this recording, so listeners are in for an incredible musical journey. Divine Decade is not only inspirational, but proves how diverse and brilliant one of our country’s biggest musical exports truly is.